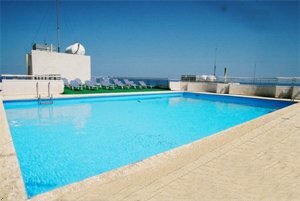 The Flamingo Beach Hotel is the best hotel on the beach near the city center and Larmaka International Airport. Easy access to Island's points of interest. Walking distance to island's best seafood and local restaurants. Walking distance to Salt Lake and Fishermen's Worf. Standard room with one double bed, sea side view, separate bathroom, high speed Internet connection, hairdryer, telephone, satellite TV, dressing table and mirror, beside lamp, radio, air conditioning, maximum occupancy is 3 including children. Go out of airport towards Larnaka town, turn right at traffic lights.